Nowadays, OCR apps are a rage among corporate houses and diverse industries that deal with daily or regular scanning of documents. This has brought about a radical shift in the work strategy and procedures of businesses. OCR technology is gradually eliminating the need of manual typing or data entry from our work habits. AccuraGo, the invention of Accura Technolabs is a document scanning solution that runs on OCR technology. It is a ready to use application that can be used to scan bulk amount of documents from the very time you log into it. It is compatible with iOS, Android and web platforms. The camera of the smartphone captures the image of the document followed by the accurate extraction of text with the help of OCR technology. 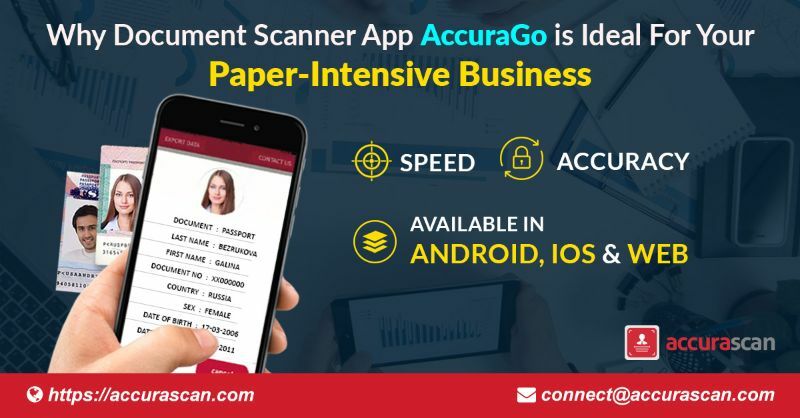 Let us see how AccuraGo helps paper-intensive businesses with its scanning solutions. The document recognition time of AccuraGo is 500 milliseconds. For its fast scanning speed, a huge bulk of documents can be scanned easily within much less time than traditional scanners. Many industries like banks, travel and tourism, hospitality etc. highly depend on document scanning in their day-to-day operations. This factor leads to huge wastage of productive time. In order to focus on business growth, much time cannot be wasted on manual tasks. AccuraGo streamlines scanning and helps to leverage the resources that industries otherwise waste on carrying out this activity. Business is about making more profit with as limited investment as one can make. The less one can spend the better. In manual work, there is always the risk of errors involved. If they are detected while typing, they have to be corrected at the moment but if they ditch your eyes, the repercussions later may take a magnified form. You never know if these mistakes could cost you financially too. AccuraGo runs on OCR technology and directly extracts data from the documents. This ensures 100% accuracy. Hence, there is no scope of errors. Scanning with AccuraGo will save you the cost of papers, files and registers which you would otherwise need for manual works. You can also avoid the cost incurred on the periodic maintenance of traditional scanner if any. To de-clutter your space, desks, tables, drawers and shelves of the papers, files and registers, you need AccuraGo. As the app automates your entire operation process, you will no longer need all that hundreds and thousands of hard copies lying all around. Scanning makes the process clean and organized thus allowing the business to do with a much smaller space or utilize the bigger space for other useful work like, setting up a help desk table. Papers lack longevity and are prone to loss or destruction. Digitizing the important details and records will make work more efficient. Having a digital record of everything on your system helps to retain all necessary details as well as gives access to only authorized people. AccuraGo is a SaaS-based solution compatible with Android, iOS, Windows and Linux platforms. Hence, it offers ample scope for businesses to use it on device and operating system of their choice. AccuraGo app is developed by Accura Technolabs, Singapore. The company has also developed Accurascan, which unlike AccuraGo, has an SDK/API that can be used to integrate with third-party applications or to customize them. Accurascan works offline. Download the demo version of Accurascan from Google Play store or App Store. Copyright © AccuraTechnolabs All Right Reserved.